The Rosette Nebula, also known as NGC 2237 or Caldwell 49, is a vast spherical H II region in the Monoceros constellation. What does it mean for an astrophotographer? It’s a fantastic astrophotography target for DSLR and small telescope (or telephoto lens) owners! If you want to capture one of the visually most beautiful deep-sky astrophotography targets, this guide is for you. Looking for more interesting astrophotography targets for beginners? 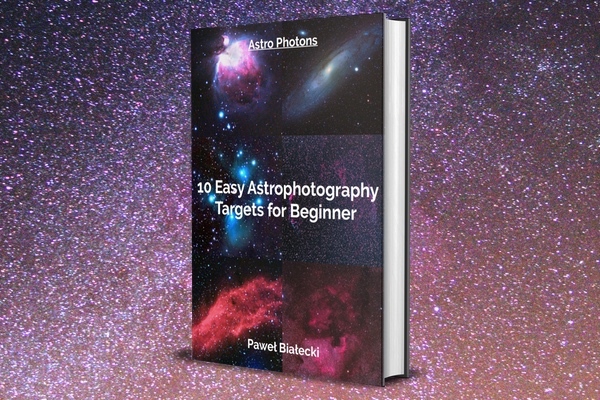 Check out my free PDF eBook: 10 Easy Astrophotography Targets for Beginners. It’s free and instant-downloadable. Rosette Nebula. Taken with Fuji X-T20 camera, Sky-Watcher Evostar 72ED telescope, and Fornax LighTrack II equatorial mount. 80 × 60s lights (1 hour and 20 minutes total integration time) @ ISO 1600. The Rosette nebula is very easy to locate due to its proximity to the Orion constellation. They are both considered as winter astrophotography targets, so prepare to shoot them from late November to early March – they are not easily available outside this time range. So, how to locate the Rosette Nebula? First, locate the Orion Nebula. There should be an orange star near to it – it’s Betelgeuse. The Orion Nebula, Betelgeuse, and the Rosette Nebula form an imaginary triangle. Look for the Rosette at the left end of it (see at the picture above). If you are not familiar with the night sky, download a free planetary software Stellarium and play with it; it’s a fantastic app for astrophotographers and night sky enthusiasts. For iPhone and iPad owners, I have a list of best astronomy and astrophotography apps for iOS. You don’t need specialized astronomy equipment to capture the Rosette nebula. Any entry-level DSLR like Canon EOS Rebel SL2 will do the job. And that feeling when you see the emerging nebula on your LCD screen for the first time ever is once in a lifetime moment (the next wow-moment is when you actually process all the data and see the final image). More important than a camera is a telescope. Rosette is bigger than the Orion nebula, so you need a large field of view to capture it as a whole. I recommend a small APO telescope like my Sky-Watcher Evostar 72ED (view on Amazon). Other good refractors to consider are Explore Scientific ED80, William Optics Zenithstar series, and Meade 70mm Quadruplet APO. Me during shooting the Rosette Nebula on my balcony. The backlight is there thankfully only for this picture purposes. It’s dark enough here to practice astrophotography (with light pollution filters of course). Closer look at the gear. If you want to learn PixInsight, I highly recommend Warren A. Keller’s book Inside PixInsight. 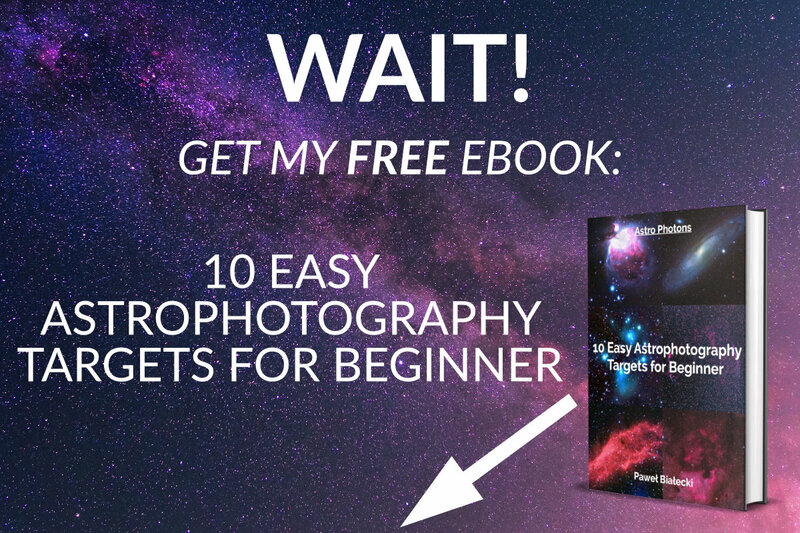 Join my free astrophotography newsletter and get a free copy of my eBook - The 10 Best Deep Sky Astrophotography Targets for Beginners! Join my subscriber list who get content directly to their inbox. 100% safe, no spam ever. Hello, I'm Paweł Białecki, an astrophotographer from Poland. On this blog, I share my astrophotography knowledge and help beginners to make their first steps. Subscribe to my FREE astrophotography newsletter and grab my PDF eBook: "10 Easy Astrophotography Targets for Beginner"! Join my over 150+ subscribers who get content directly to their inbox. Join my subscriber list who get content directly to their inbox.